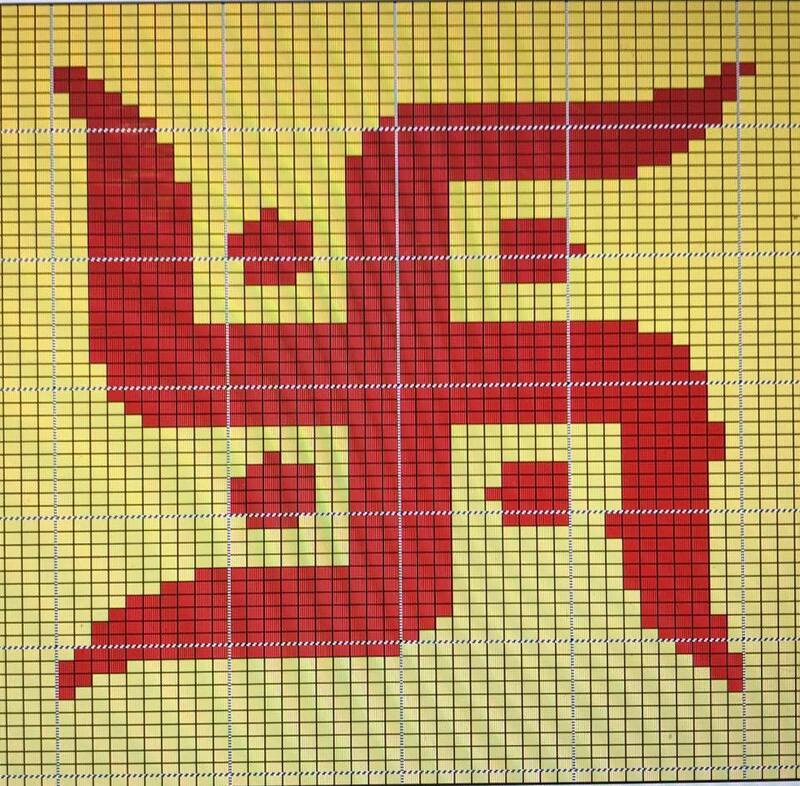 Suvastika is an ancient religious symbol originating from India. It is one of the most sacred and auspicious symbols in Hinduism and dates back at least 11,000 years. The name Suvastika comes from the Sanskrit (Devanagari: स्वस्तिक). Suvastika in Sanskrit means any lucky or auspicious object, and in particular a mark made on persons and things to denote auspiciousness, or any piece of luck or well-being. The Hindus represent it as the Universe in our own spiral galaxy in the fore finger of Lord Vishnu. This carries most significance in establishing the creation of the Universe and the arms as ‘Kaal or time, a calendar that is seen to be more advanced than the lunar calendar where the seasons drift from calendar year to calendar year. The Suvastika symbol is seen in, the Indus Valley civilization, which is now proven to be more than 8000 years old. It is also an auspicious symbol in the two religions which arose from Hinduism – Buddhism and Jainism. The Suvastika was used in Tibet and China, And was also introduced to Indonesia by Hindu kings. Since Hindu civilization was widespread…..It was also used in Vietnam, Cambodia ,the Mayan and Aztecs civilizations etc in the ancient world. (dc – double crochet – if you wish to make a bigger piece use dcs in your C2C instead of half dcs…. This is one block or cluster. Always keep count…that is very important….at every step make sure the number of steps tally to the counter of blcoks given in the pattern. Once you finish a row…recount the total number of blocks in each colour in that row and tally the total blocks. Proceed only when the tally is exact. Keep the graph and the written instructions in front of you at all times. I carry yarn only for upto 3 blocks….anything more than while using dc or hdc I find shows the carryign thread esp if it is of a birght or contrasting colour shows through. In tapestry it is easy to carry the colours forward beocs the scs are short stitiches and does no tallow the carrying thread show. By making shuttles of each colour…I simply add a new colour as and when the colour needs to be used after three blocks. Below please go thorugh the link which wI use to keep the yarn’thread from tangling. As you can see in this graph, the picture has some pixels in the wrong places though I used Stitch-board to do this one. 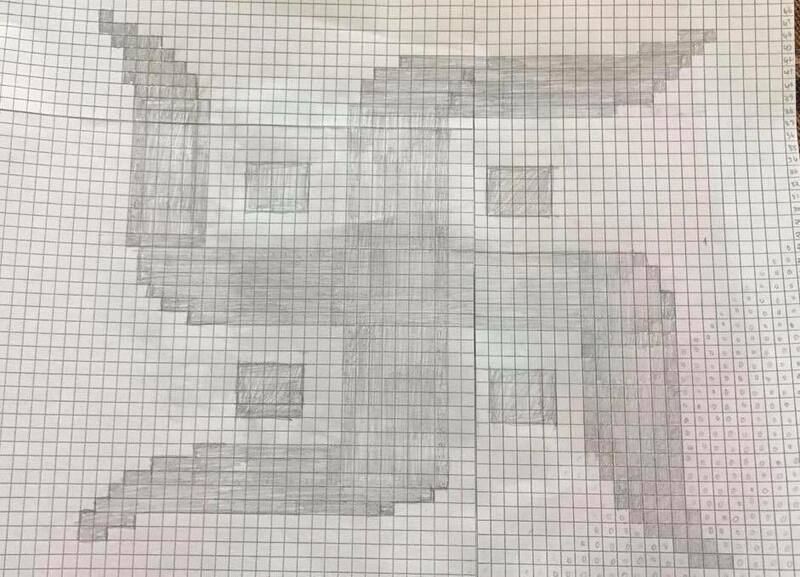 The dots haven’t come out right at all and the lower leg of the right had side of the Suvastika had a few pixels out of place. So use the graph only to help you visualise the final project. I graphed this one by hand…. To make a wall Hanging…. Create a crochet edging on the top and bottom, broad enough to wrap around a 1 mm curtain rod/steel/wood/ aluminium rod-pipe etc (cut to size). Then use any edging pattern on the top and the bottom….fold it ….join the top of the edging to the top edge of the C2C on both ends. stick in the rods…if you hace you can enhace the edge of the rods with curtain stoppers…or make your own crochet curtain stoppers. tie a medium thick decorative string on two ends of the top rod and VOILA…you have a lovely wall hanging. 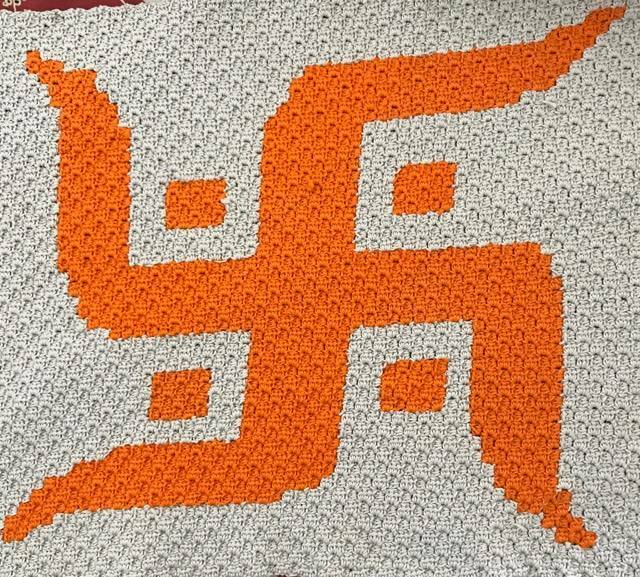 And there you are …A Beautiful Suvastika.…You can use it as a wall hanging in your Pooja Room. Or can roll it and keep it safely and use it just for festive occassions and Sathsangs. Imagine how you can enhance the devotional aura of your home when having a pooja, yagna, Sathsang etc by hanging these sacred symbols on the walls in the room you are holding such sacred functions…..
Do u carry the thread along or cut it when u work? Thanks for the detailed pattern.